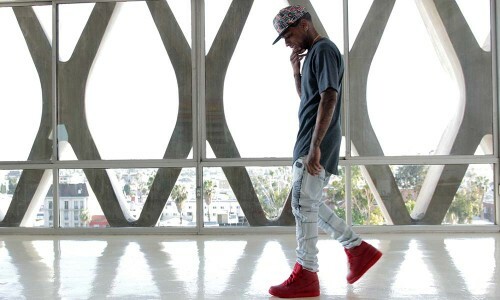 Last week, we released our fourth installment of Footaction’s Style Means series starring Kid Ink. Preceded by G-Eazy, Hit Boy, and YG, Kid Ink joins an elite group of hip hop stars known for their signature style. During filming, Kid Ink, poised for super stardom, sat down exclusively with Star Club to discuss everything from style to his musical influences to his plans for the future. The full interview, picked up and reassembled from the editing room floor, can be read below and will give you even more insight to the psyche of Kid Ink. I think my style definitely changes. I might change periodically throughout the day based on certain situations. You have to be comfortable. Everything has its moments. During the day it’s more sports wear, more shorts, sweats, things that are more comfortable. I might start off with some tank tops and shorts and by the time night comes, that’s when there are flashy moments. Cali and the West Coast has influenced my style a lot. High knee socks has been something I’ve grown up with throughout LA all my life. I was wearing high knee socks when everyone was wearing ankle socks just because that was something that me and my friends were always in to. I’ve watched how that now went all the way to people wearing the dry fit pants under shorts and that’s giving the same effect and look and I’ve seen that grow. Tattoos for me with tank tops and tattoos and cut offs are something that’s from LA just because it’s hot all the time. It’s not something I would have picked up from the East Coast because you can’t wear that all the time out there. The number one go to is Jordan 1s because those are the most comfortable shoes I’ve ever worn on stage. I tried to step my show up to having a theme to it. My theme lately has been like a dark knight/vampire/Dracula type theme so I’ve been sticking to a lot of blacks and longer clothes and layers – stuff that looks more villain-ish. On stage it needs to be something you would never even wear off stage. It’s a show so you want to give people a show. It’s more of the villain side of things, the vigilante thing. When you see the villains come through with the trench coats – I think that played a part in my stage presence. I feel like the villains are always more fashionable than the super heroes. I got into music first just from it being around me from my mother. My mother was a writer herself and she used to play the piano and sing. I knew how to play the piano to an extent, I knew how to hold a tone to an extent, because those are things she did with us growing up. From there, always having a respect for music and loving the culture. It was later introduced to me by my friends in junior high who were all going to an after school type situation and learning how to produce, write and record music and I was just going there to have fun and be with my homies and it turned into a big thing to where it turned from doing that to bringing it to school and selling beats in school to selling beats outside of school to really becoming an artist and it just trickled down. My mindset changes from when I’m chilling to “on” probably the opposite of what you think. When I’m chilling my mind is moving faster and it’s going and going thinking about stuff but when I’m on, everything is a little slower and I’m in that moment and not really thinking. I have picked apart different things. Whether it be Jay Z telling everyone to wear button ups or everyone in Cash Money running around in white tees and bandanas – even if it’s Cam’ron wearing pink. You pick it and make it your own. I’ve never had an artist wear something and wear the exact same thing. I look at everything and see how I can make it my own. I want to be a trendsetter. I become a homebody for the first week. I have a lot of friends and family that come on tour with me but when we get back is when we actually get to just chill and not work and be our fun selves. We turn up all the time. To check out for personal health is very important and it’s something I learned starting out this year having such a hectic last year with more than 220 [show] dates. Being on the road and then being in the studio every day I wasn’t on the road and really working as hard as possible – last year hit me as soon as the top of the year started and I found myself almost passing out at shows from not eating and not sleeping well. That’s the kind of stuff that comes back on your body. If there’s anything I could go back and tell my younger self back in high school is probably be a little bit more confident. Back in high school I was a little less confident in certain areas. Whether it be the work ethic side of things or just talking to people in general. Now I’m a little bit more confident but it was something that was forced with being a producer at first and feeling like I was a lot more behind the scenes. I was a homebody sitting behind the scenes making beats all day and not really in the face or having to meet fans. As soon as I became an artist it’s more of me not only having to speak for myself but then you become the person who is speaking for other people – this movement, your group, and your fans – and they’re responsive about how much your songs meant to them. You have to break out of that shell after a while. Their opinions matter more than they think. I’m definitely listening to the fans and making sure that everything that they’re saying is reflected back towards me because those are the people that I’m speaking for and the people that are going to buy my records and as soon as they get bored with what I’m talking about is when that stops. There’s a lot of different moment where I felt like I made it. A time I felt like I made is when my family found out but not necessarily money or being successful. It’s when they started treating me like a celebrity – even when people I know aren’t calling me by my first name. It opened my eyes – it’s bigger than just fans now. Full, interview, Means, Style, Vol. Every year, South by Southwest takes over Austin, Texas and serves as a global festival for new technology, movies, and most importantly to us, music. 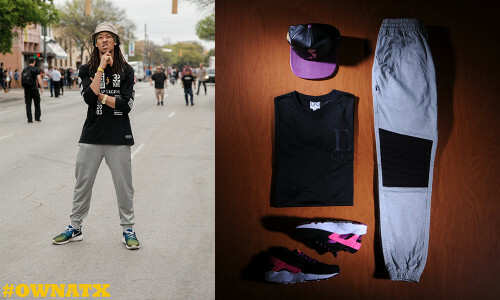 Footaction couldn’t miss the opportunity to hit the streets of Austin and scout some of the freshest looks out there. As an urban festival, SXSW has a very different vibe about it than a camping festival in that, you get to go home each night and come back out the next day with some new heat. 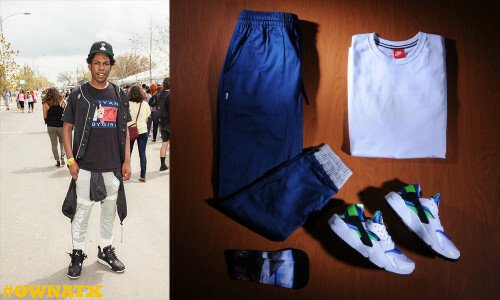 Above you will find a diverse gallery of the looks that we think made a splash in Austin. They range from joggers and a tee to hook ups that might be considered more complex. Either way those that you see above deserve a shoutout. 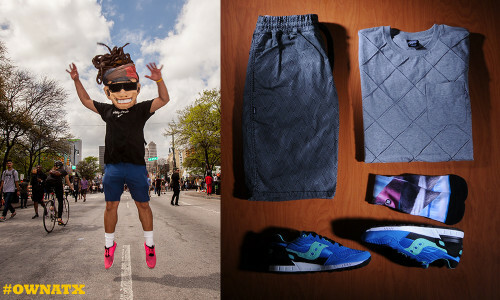 If you want to see Footaction’s updates from the weekend in real time, head to twitter or Instagram and search #OwnATX! Below you will find five hook ups that we’ve curated from apparel currently available at Footaction. Each laydown doesn’t necessarily entirely mimic the the complete style of the subject but each has elements from the other and we hope will inspire you to own your look. For the third installment of Footaction’s Style Means series, we linked up with Bay Area rapper, G-Eazy, who most recently dropped his album These Things Happen which hit #1 on the iTunes Hip-Hop chart. Also recently numerous accolades such as MTV’s “Artist to Watch,” G-Eazy has separated himself from the other musicians in his genre by building a strong brand that fuses music and style. G-Eazy is known for his classic, vintage-inspired style for which many have deemed him the “James Dean of Hip Hop.” In the video above, he discusses how he brings new energy to each show and how style plays an important part in his performance preparation process. His unique style and focused work ethic will be a surefire pathway to success for the young rapper. In the images above, G-Eazy is getting a fresh cut before his Power 106 Cali Christmas performance. In another image, Footaction hosted a private dinner in Los Angeles with hip-hop musicians G-Eazy, Hit-Boy and Casey Veggies. 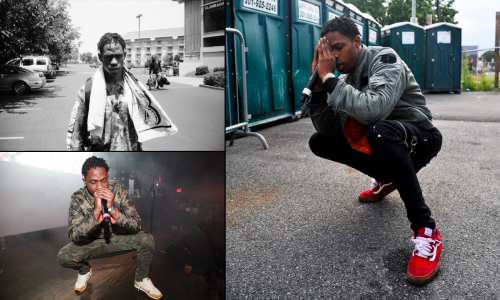 At only 21 years old, Travi$ Scott has been able to gain the trust of some of Hip-Hop’s greatest like Kanye West and T.I. for the race to be the genre’s future king. A multitalented musician who both produces and raps, it’s his energy and idiosyncratic personality that sets him a part from the rest. His music and live shows are bass-heavy and adrenalin-pumping, while his demeanor as a person is quite the juxaposition of that. He can never really look at the camera or interviewer in the eye when he’s responding — a testament to being in his own world always. It’s no secret that he’s one of the musicians nabbed as a style influencer, while being photographed for a wealth of publications. His style can range from the “leather jacket” look of timeless cool worn with modern flair, to a “street” comfortability and cool with graphic tees with his ties to #BEENTRILL and ILLAMERICA, to a more utilitarian and military-inspired approach with the use of camo and jackets with details inspired by war. Regardless of what he’s wearing, there’s no doubt that La Flame carries enough natural confidence to make his presence felt anywhere. Running shoes, once limited to performance on the track or the rugged terrain of the outdoors, are now seen on the feet of many as their staple for everyday wear. How exactly did we get here? After doing some research in the field and talking with well-respected sneakerheads, we’ve come to couple conclusions about this style trend. 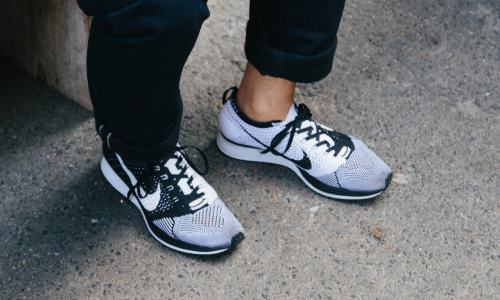 One reason why we believe running shoes have evolved to become an everyday staple is because of innovation, which can be seen most clearly with the Nike Flyknits. When the HTMs dropped a few years back, it was the first time anybody had seen a different way of creating a light shoe. Running shoes today have reached the pinnacle of comfort meeting great design. It will only get better. Another reason is that modern design trends pay homage to older styles from the early 90′s or even further. Walking around in the Manhattan area of New York City is where we first noticed the proliferation of how many individuals were wearing performance sneakers to balance out their outfits. The theory was solidified when we spotted a young man rocking the rerelease of the Air Pegasus 92 worn by the US Olympic running team when they took the gold back then. It’s inspiring to look back into the archives where sneakers like the Air Max 1, which was first released back in ’87, is still fresh and relevant. Show and/or tell us what kicks you’re rocking today in the comments! 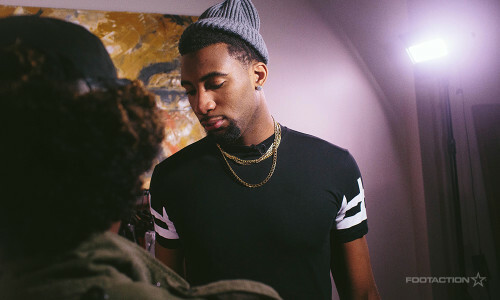 Andre Drummond, the standout center for the NBA’s Detroit Pistons, gets his outfit game correct with the Rachel Johnson, a popular NBA fashion stylist. The video was shot in the New Orleans during the NBA All-Star festivities last weekend. Drummond’s dominant performance, logging 30 points and 25 rebounds, earned him the MVP trophy in the NBA Rising Stars Challenge.